First, let me be clear. I am a fan of James Patterson. I love his novels– mostly I’m sticking to the Alex Cross novels these days. However, I also have a love/hate relationship with Mr. Patterson. LOVE the Alex Cross novels– hate the medical info. I don’t think Mr. Patterson is hurting for money which is why I’ve requested several times on this blog for him to hire me as his medical consultant– because though he’s a great story teller– he does need help in this area. 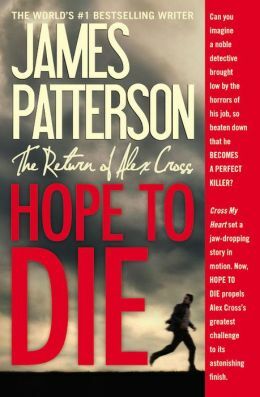 In Hope to Die (Alex Cross #22) James sets up a very implausible medical scenario that I’m going to discuss here. There are spoilers in this post— you have been duly warned to read no further if you haven’t read the novel. In this book, Alex’s entire family is kidnapped. That includes his ailing, elderly grandmother (who is at least in her late 80s or early 90s from what I can tell), his middle-aged wife and a couple of teen-aged kids. AND– there is not a medical attendant 24/7. Just a group of people, drugged, on life support for a week. Oh, they are checked ONE time during the week. Let’s talk about the medical aspects and how this scenario would never work. 1. The tubes. When someone is on life support– there’s going to be a tube in every orifice as they say. The tube that keeps them breathing. A tube into their stomach to drain secretions. A tube into their bladder to drain their urine. And they will still poop– I’m just being real people. So if no one is there to drain these items and ensure that they stay in the proper place it will cause life threatening issues for the patient. 2. The drugs/fluids. It’s not so much that I have a problem with the drugs that were used– more the fact that no one is there to change them out. Keep in mind, someone on life support cannot eat or drink for themselves. This has to be provided for them. If your goal is to just keep them hydrated then an adult needs, let’s just say, 100ml/hr to maintain hydration. That means a one liter bag is going to last 10 hours. Then the sedation drugs themselves need to be changed out as well– they are not going to last forever. 3. The oxygen. It is very rare that a ventilator doesn’t use oxygen. Ventilators generally don’t run off O2 tanks. They need a special source with adapter. So, how are all four of these vents running? Even if we could leap to oxygen tanks– again– who is changing them? 4. Electricity. Everything connected to the patient runs on electricity. IV pumps can run on batteries for a certain length of time but probably not more than 12 hours. Ventilators require a power source– they must be plugged into something. There is nothing scarier for an ICU nurse than when the electricity goes out and you’re waiting for a back-up generator to kick in. Most often– this is seemless because vents are plugged into emergency outlets that are always fed electricity expcept under dire circumstances– like a hurricane or tornado takes out your back-up systems. If that happens, the patient must be manually bagged with an oxygen tank. 5. Turning. If bed-ridden patients aren’t repositioned every few hours they are going to develop pressure sores. This puts the patients at risk for skin breakdown and infection. Also, immobility increases the risk of developing blood clots as well. 6. Drug Metabolism. The author is also assuming patients metabolize drugs and use the same drug dose. This is not true. Drug dosages in pediatrics is calculated based on the patient’s weight. Adjustments are made in the elderly population as well. So James– loved the story but the medical scenario . . . please.